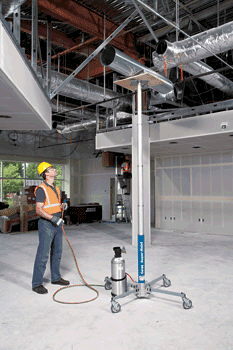 Based on the first Genie product, the 1966 Genie Hoist, this portable telescoping pneumatic hoist uses CO2 or compressed air to lift loads up to 300 lbs (136 kg) to a height of 12 ft 5.6 in (3.8 m) or loads up to 250 lbs (113 kg) to a height 18 ft 4.5 in (5.6 m). The hoist is powered by either CO2 or compressed air. A one size fits all bottle-mounting bracket accepts any common CO2 bottle size, and the hose stretches 16 ft (4.87 m) for added mobility. Up and down functions can all be activated from the patented pistol-grip control handle. Lift, position and install a wide variety of materials, including metal and fiberboard air ducts, overhead sprinklers/plumbing, drywall and ceiling panels, and electrical fixtures. The Super Hoist sets up in seconds no tools required. The unit s compact size and weight allow one person to lift and move heavy loads, yet quickly move from job to job. It s so portable, it fits in the trunk of most cars. * Please call us for any questions on our jack hi lift air 250 /18 foot serving Honolulu, Waikiki and surrounding communities on Oahu.